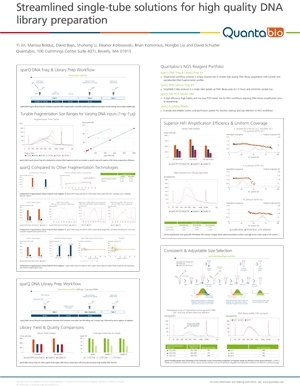 sparQ PureMag Beads is a fast and reliable nucleic acid purification system for reaction cleanup and size selection in Next Generation Sequencing (NGS) workflows. Based on the reversible nucleic acid-binding properties of magnetic beads, this product can be used to quickly remove primers, primer-dimers, unincorporated nucleotides, salts, adapters and adapter-dimers from NGS library prep reactions to improve downstream sequencing performance. sparQ PureMag Beads allows excellent recovery of fragments greater than 100 bp without centrifugation or filtration. Consistent and reliable size selection can be achieved by simply adjusting the beads to sample ratio. This product is designed for both manual and automated processing, allowing seamless integration into existing workflows. Double-sided size selection is used to remove smaller and larger fragments from either side of the desired region. The fragment size can be easily adjusted to suit the application by manipulating the sparQ PureMag Beads to DNA volumetric ratio. Electropherogram of fragmented human genomic DNA pre- and post double-sided size selection. 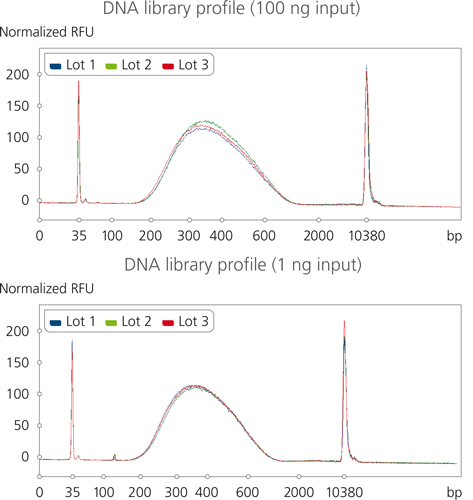 Different sparQ PureMag Beads to DNA ratios were used to achieve various targeted size range. Highly reproducible DNA library profiles were achieved using different lots of sparQ PureMag Beads and a broad range of input amount. Libraries were prepared with sparQ DNA Library Prep Kit from 100 ng and 1 ng of fragmented microbial genomic DNA. sparQ PureMag Beads were used post adapter ligation and PCR amplification to effectively remove adapter-dimers and primer-dimers. sparQ PureMag Beads show equivalent performance to AMPure XP for DNA purification. 50 bp DNA ladder was purified with sparQ PureMag Beads and AMPure XP at different beads to DNA ratios and analyzed on 2% agarose gel. Electropherogram of fragmented human genomic DNA prior and post double-sided size selection. 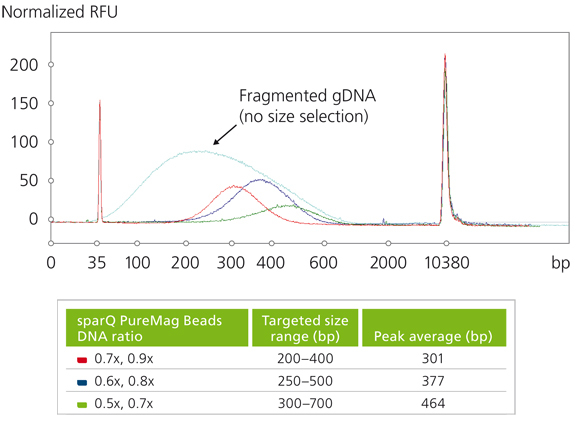 Different sparQ PureMag Beads to DNA ratios were used to achieve various targeted size range. Store the product in a constant temperature refrigerator at 2°C to 8°C upon receipt. Please do not freeze. For lot specific expiry date, refer to package label, Certificate of Analysis or Product Specification Form. Can I still use the sparQ PureMag Beads if I left it at room temperature for some time? sparQ PureMag Beads is manufactured and tested for the storage temperature indicated on the bottle and we cannot guarantee performance if it was stored outside of the recommended condition. Can I still use the sparQ PureMag Beads if it was accidentally frozen? How do I dry my samples before elution? Air-dry the beads on the magnetic stand for 5 min or until the beads are dry and before they start to crack. Do not over-dry the beads as it can reduce the DNA recovery. 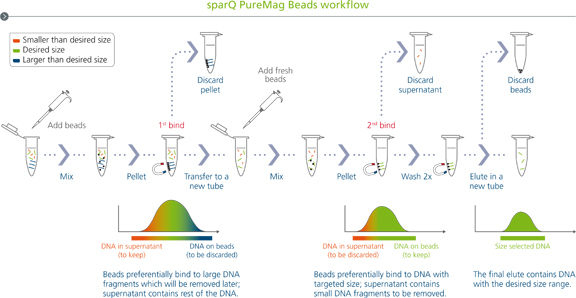 Is there a size limit for the DNA fragments that can be bound with sparQ PureMag Beads? sparQ PureMag Beads will bind DNA fragments 100 bp and above and exclude primers 50 bases and below. There will be some recovery for oligo or DNA between 50 and 100 bases. What is the recovery rate with sparQ PureMag Beads? The recovery rate depends on many factors, including the fragment size, sample volume, sample concentration, and elution volume. Up to 90% recovery rate can be expected under the optimal condition. The yield is also correlated with the ratio of beads to sample, and the lower ratio usually results in lower yield. When the ratio reaches to 1.8X, it generally produces maximal recovery.